Do you remember the Title II Action Guide? This was an early resource issued shortly after the passage of the ADA. It was designed to assist local and state governments develop their self-evaluation and transition plans. We are happy to announce that this valuable resource has been updated to reflect the 2010 Standards and revisions to the Title II Regulations! 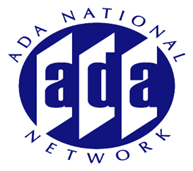 Join the October ADA Audio Conference session to see a "sneak preview" of the REVISED "Title II Action Guide (TTAG)" which is will now be a web-based resource. The purpose of this resource continues to be helping state and local governments understand their ADA obligations, conduct a self-evaluation, implement changes and develop a transition plan. The TTAG team at the New England ADA Center will provide information on the revised guide and show wire frames (the site is not "Live" yet) showing the content and explain how the site is intended to be used.